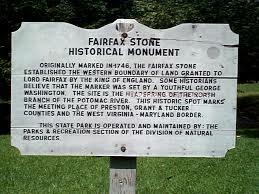 Extensive information on the historical aspects of many of the Parks and Forests. Interpreters recreate late 18th century lifestyle through period attire, demonstrations of a variety of colonial crafts, and the fort. At the junction of the Ohio and Kanawha Rivers in what is now West Virginia, this area commemorates the frontiersmen who fought and died at the Battle of Point Pleasant. Nestled on the rim of the Gauley River Canyon near Summersville, West Virginia, Carnifex Ferry Battlefield State Park is an important Civil War battle site. Droop Mountain Battlefield State Park is located in the Greenbrier River Valley north of Lewisburg and is the site of West Virginia’s last significant Civil War battle. The dense forests of Holly River State Park provide guests with a natural feeling of peaceful solitude. In each of these four parks’ section below are links for materials from the”West Virginia State Parks – Special Places – Past, Present & Future” (deactivated) website. WV DNR has indicated it will no longer print brochures for WV State Parks and Forests, using digital media instead. MH3WV has been able to retrieve and archive the pdf of each printed brochure and will keep them available–the date of the printed version is usually in the lower right corner, in small type, on the back of the brochure. 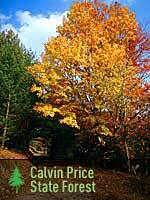 These brochures are linked in each park/forest/wildlife management area’s section below. 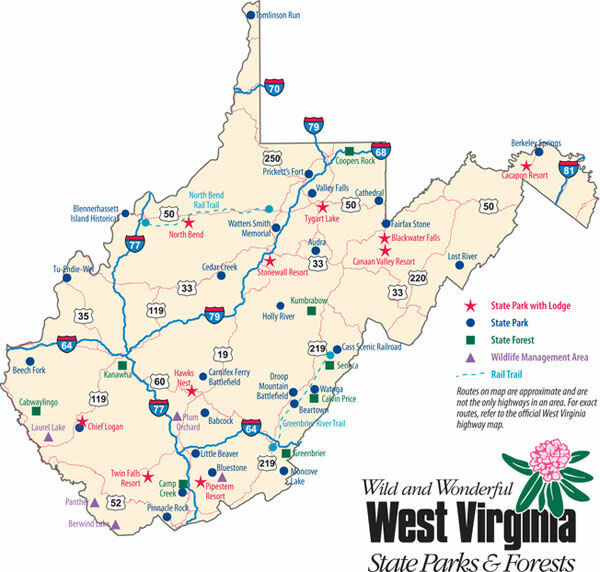 View, download and print trail maps for WV State Parks and Forests. “Babcock State Park and its 4,127 acres of rhododendron-lined trails and rippling, rock-strewn streams is one of West Virginia’s most iconic locations. Located 20 miles south of the New River Gorge Bridge, the park is most known for the Glade Creek Grist Mill, a fully functional replica of the original Cooper’s Mill, located nearby. Other attractions include recreational activities like hiking, fishing and boating. Explore information from West Virginia State Parks – Special Places – Past, Present & Future’s “The Glade Creek Grist Mill” (deactivated) website. 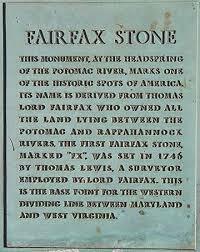 Explore information from West Virginia State Parks – Special Places – Past, Present & Future’s “Ye Fam’d Warm Springs” (deactivated) website. Explore information from West Virginia State Parks – Special Places – Past, Present & Future’s “Blennerhassett Island” (deactivated) website – includes Blennerhassett Museum of Regional History, Blennerhassett Island, Blennerhassett Mansion, and the Putnam-Houser House. Though owned by the State, Canaan Valley Resort State Park is managed by a private company. It does not have a WV DNR Brochure. Explore information from West Virginia State Parks – Special Places – Past, Present & Future’s “Cass Scenic Railroad” (deactivated) website – includes Whittaker Station, The Town of Cass, Spruce, and Locomotives. Though owned by the State, Stonewall Resort State Park is managed by a private company. It does not have a WV DNR Brochure. 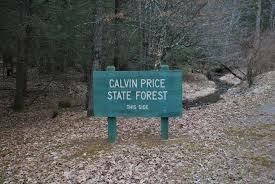 Calvin Price State Forest is managed and maintained by adjacent Watoga State Park and the WV Division of Forestry. It does not have a separate brochure. 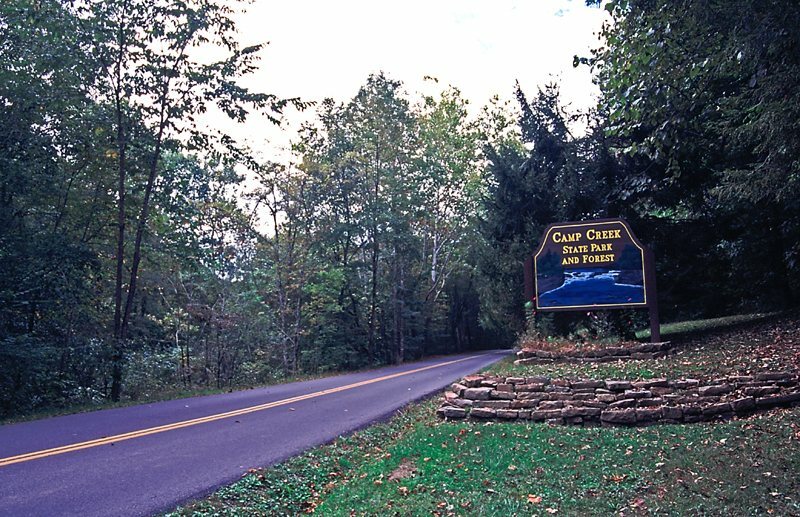 Camp Creek State Forest is managed and maintained by adjacent Camp Creek State Park and the WV Division of Forestry. It does not have a separate brochure. As of 2003, 1.4 million acres, representing eight percent of the state’s total land area, are managed by the DNR’s Wildlife Resources Section for public wildlife-associated recreation. There are more than 77 Wildlife Management Areas in WV. “The recent four-percent budget cuts affect all DNR Sections but in particular, the Parks and Recreation Section, which is most reliant upon state General Revenue. After careful deliberation with the Cabinet and DNR Executive Staff, I would like to describe how the current cuts will affect us. But first, we want you to know that top priority was given to retaining all of our valuable staff while maintaining a management presence at the affected facilities. Addressing various federal-aid related audit findings added to our decision making. That is, federal revenues dedicated to Parks and those to Fish and Wildlife Restoration must do just that. Also, some activities or aspects of facilities have costs far in excess of their revenue. The website for the Bluestone WMA is still active as of March 2017, but will probably be deactivated in the future. The brochures for Berwind Lake, Bluestone, Laurel Lake and Plum Orchard Lake have been archived by MH3WV, and will remain available for historical purposes.